As I may have oh so briefly mentioned, I’m going to be doing a fairly intense (I had no idea how intense…) obstacle run at the end of March, which I’ve been training for by using a 5K running app (see here, I LOVE it!). However, there’s more to an obstacle run than running. You may have caught that obstacle part, there. YES! There are obstacles! Now, thanks to a variety of fallen trees and other hazards in the local woods, I’ve been getting quite a lot of obstacle training into my runs, but none of them compare to the challenges that lay ahead… So, there was only one thing for it – another challenge, part training, part confidence boost, and all over good fun – Go Ape! I knew this would be the perfect chance to get a little workout in, see how well we were all doing, and catch up with my team mates at the same time. 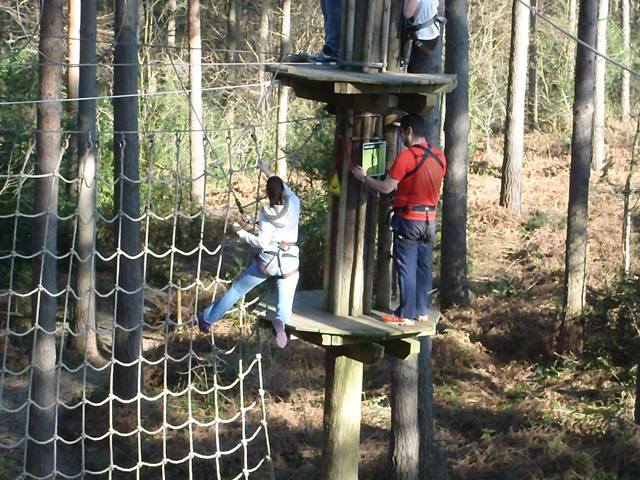 I’ve been to Go Ape four times now (that’s me above back in 2010!) and I’ve loved every visit, so I knew it would be awesome! So, last Sunday, enjoying the first day of spring weather, we headed to Alice Holt. The course is very lively, and beautiful in the sunshine, consisting of five sections, four of which are accessed by climbing a rope ladder. You start off with a safety demo (and I was picked on to be the volunteer this time when it turned out I had a PR pass!) 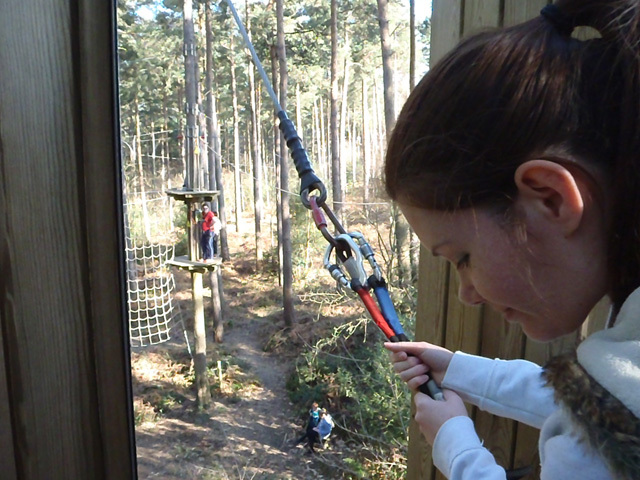 and learn the ways of Go Ape, in which safety is paramount. Swinging from a tree is serious business, but there are so many safety procedures involved it’s very safe – if you follow instructions. You have a variety of clips and attachments to make sure you’re always anchored in multiple places, which is very reassuring when you’re hanging from a tree in the middle of the forest. I have no idea how high these platforms are, but I have to tell you, they do make your knees go funny when you stand on the edge! Once you’ve done your safety demo, which involves the first of five zip wires (how else would you get down from such a great height? 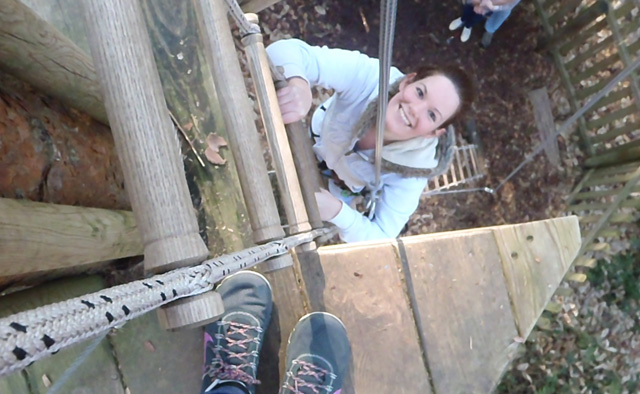 Zip wire, of course! ), you get to start on the first ‘big’ set of crossings. First of all, you need to climb a rope ladder (can I overcome the obstacle of a rope ladder? YES! 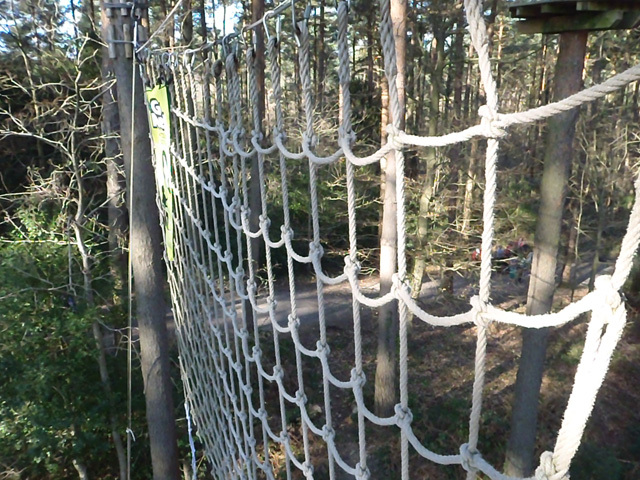 ), and then you’ll face the first of the two Tarzan swing / cargo net combos. 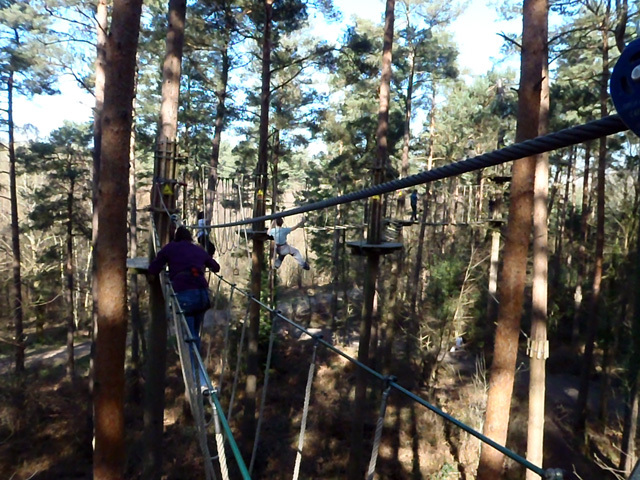 This is the part I look forward to the most – weightlessly flying through the trees, before a quick scramble up a net – which is one of the obstacles we face at the run at the end of the month! The swing is daunting, and the cargo net is tough, but that’s what makes it so much fun! 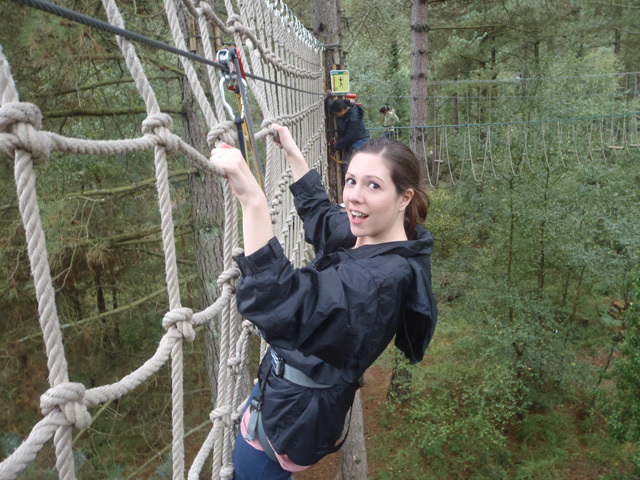 Unfortunately, we had a young girl in front of us at my visit who completely freaked out at the Tarzan swing, and despite careful, patient and professional coaching from one of the Go Ape team, she eventually had to back out and come off the course. 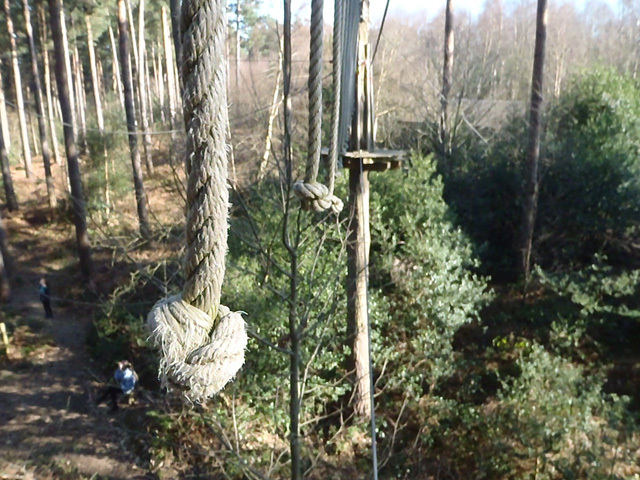 The first Tarzan swing is the test of your courage – if you can’t make it across, it’s unlikely you can do the rest of the course. But we’re all made of stern stuff, right? Of course! The first cargo net is tougher than the second – I think it’s slightly looser – but we were really pleased with how well we managed to haul ourselves up them. Can we overcome the obstacle of the cargo net? YES! 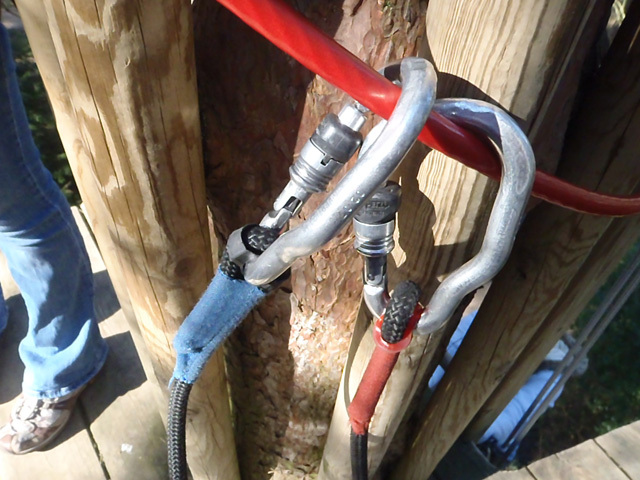 The rest of the course is made up of various methods of getting from one tree to another – there’s always a metal cord that you stay clipped to as you go along, so you cannot – cannot – fall off of anything as long as you’re attached. 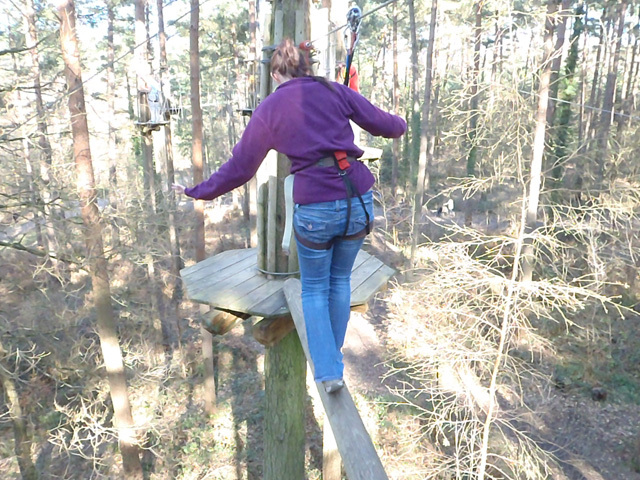 The challenges vary from easy (wooden blocks to step on) to bloody difficult (stirrups), but if you ever have enough and just cannot take the strain, all you need do is relax into your harness and pull yourself along to the next tree platform. 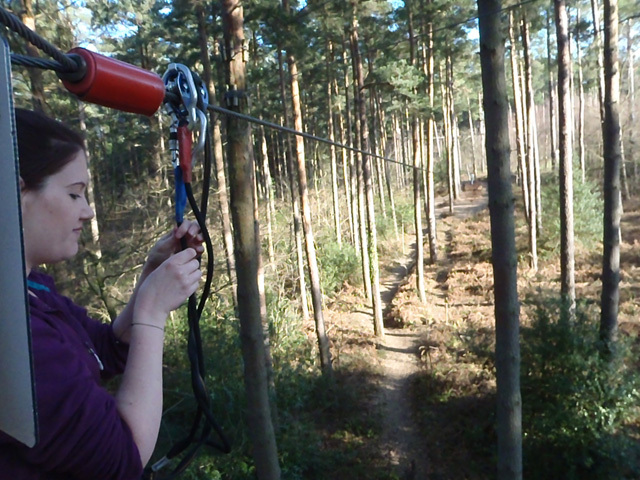 …and it’s seriously the best fun you can have in the woods when you’re stuck up a tree. Amazing! When you’ve finished your course, you even get a certificate and can pose with the Go Ape ape for a photo (if you bring a camera, natch), just to prove how awesome you are! 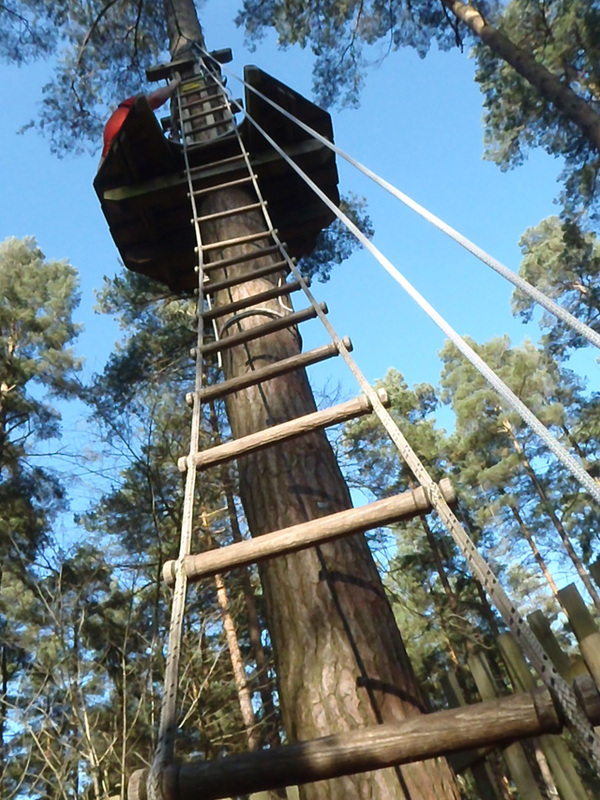 Book your own tree top adventure with Go Ape at www.goape.co.uk. They even have segway courses (and you know how much I love segways!) and loads of locations all the way across the country (find out here). Tickets cost between £30-32 for adults, £24 for 10-17 year olds, and they even have special courses for tiny ones at £17 per child! 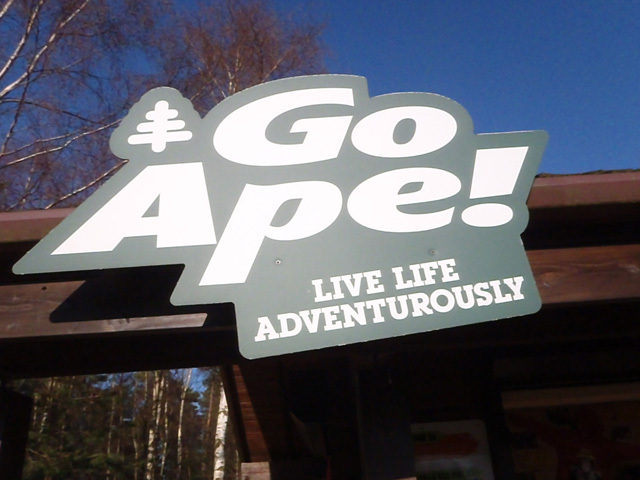 I was given two tickets for the purposes of review for this post, although the fact that it was my fourth trip is a pretty good indication of how much fun I think Go Ape is! 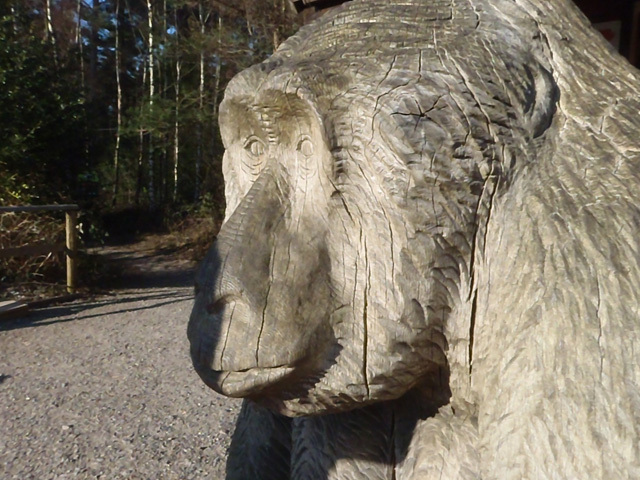 So, let me know – have you Gone Ape before? Are you planning to? And how do you train for obstacle runs like Tough Mudder or X-Runner?